Yoga originated from the religious beliefs of India, Nepal and Tibet. In the West, the religious and philosophical aspects of Yoga have been generally striped away and emphasis is placed upon the postures of Yoga (Asanas). Various Yoga masters have traveled to the West and introduced their versions of the Asanas. In America, most schools of Hatha Yoga date from the techniques introduced in the 1920's. A more recent introduction is Kundalini Yoga, which was formerly a secret north Indian style of Yoga, that was only introduced to America in 1968. We currently offer a fusion of two styles of Yoga; Hatha and Kundalini. Both styles are available as independent programs. Yoga literally means "to yoke or harness". These styles "harness" in two very different ways. Our current Yoga program is a fusion class that incorporates techniques from both Hatha and Kundalini Yoga plus movements from Western physical therapy protocols to address the most comman physical complaints we hear from our students, low back pain and stiff neck. Yoga classes are done on a fully padded gymnastic mat that is extremely comfortable. Yoga mats are available, but not required because of the softness of the floor. No special clothing is required. Clothing that allows unrestricted motion is recommended. Our fusion Yoga class is an innovative class that blends several forms of mind/body exercises. The class begins with Oriental breathing exercises (primarily Qi Gong) and flows into an alternating sequence of gentle Hatha Yoga (that emphasizes stretching and range of motion) and Kundalini Yoga (that employs rhythmic motion to awaken and energize the body's internal energy). The environment of the class is one of sacred space. The music is simultaneously relaxing and invigorating. The lighting is dim, in the Kundalini tradition, to encourage the student to "feel" more of themselves and the benefits of the program. This is not a "work out" that one might get at an aerobics class, but more of a "work in". You will leave feeling more "in touch" with your body awareness. The class finishes with Oriental Breathing and Chakra work. 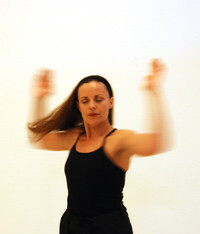 At the end of class, you will feel rejuvenated and relaxed with an awareness of whole being and well being. There are many types of Yoga in Indian, Nepal and Tibet whose roots trace back to antiquity. In the 1500s, Hatha Yoga, was developed in India. It codified a series of postures and stretches, to make the yogi more physically fit, to enable them to survive the rigors of the forms of mediation that many of the ancient forms of Yoga demanded. Hatha Yoga is what most Americans think of as Yoga. It is a series of static stretching postures that are held for a few minutes. This is an ideal yoga for those seeking greatly increased flexibility, increased strength and a vigorous workout. In Hatha Yoga, students will leave the class with the refreshed afterglow of exercise. The emphasis in Kundalini Yoga is to unlock the body's internal energy. Kundalini Yoga emphasizes rhythmic motion and breathing techniques. You don't have to be a "pretzel" to do Kundalini Yoga. Movements are easy and natural to perform, balancing range of motion between flexion and extension throughout the body.